Belle Promenade's lifespan was short even for a mall. It lasted 16 years, from 1983-1999. Its golden time lasted only about 10 years. It lay at the intersection of Lapalco and Barataria Blvds. in Marrero, Louisiana, once a separate small town that became a New Orleans suburb as New Orleans grew outward. 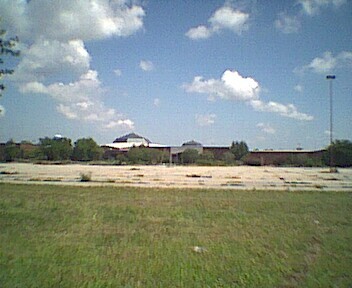 This lovely mall was once the premier mall of the Westbank of New Orleans. It almost shut down the older Westbank mall, Oakwood Center, which is closer to the city center and much more accessible to everyone in N.O. and its Eastbank suburbs. (NB: Eastbank and Westbank refer to banks of the Mississippi River. New Orleans proper is located mostly--but not entirely--on the Eastbank.) 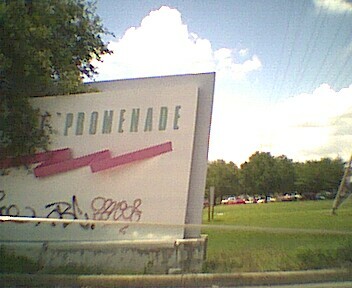 But Belle Promenade was newer and nicer than Oakwood when it was built--and had better stores. AND it wasn't near a large public housing development. So it was worth it to drive waaaaaaaayyyyy out to the edge of the Westbank 'burbs, right past Oakwood for many miles, to go to B.P. During the 80s and early 1990s (till about 1993 or so) I frequented Belle Promenade because my cousins lived near it, and we'd hang out there together. It was really kicking at that time. I didn't go again till about 1997--and the place had completely changed. It was a ghost town. In less than 5 years, it had become like a post-apocalyptic dystopian vision: empty, desolate, depressing, dreary. I had gone into the mall to eat at the food court, which I assumed was still there. It wasn't. The only thing left was Chik-Fil-A. The Chik-Fil-A corridor was almost entirely boarded up at that time. One day in 2000 or so, I looked up B.P. on the Internet, and found out that it had been demolished in 1999. 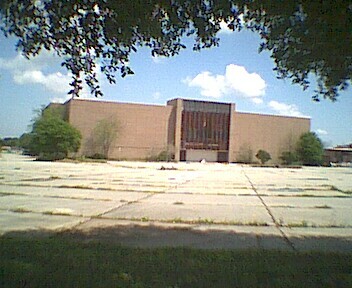 The theater lasted till 2000, till the enormous AMC Palace made its way to the Westbank. 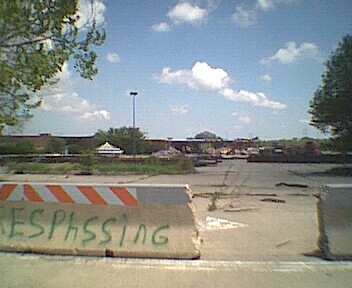 Recently I drove past the mall site to find a huge pile of rubble, with the old sign intact. To this day, most of the outparcels, such as a Hibernia National Bank and a Luther's Barbeque restaurant survive and do quite well. They've never really experienced a drop in business. So...what happened to Belle Promenade? Poor management, what? It wasn't the closing of the anchors--that really isn't as much of a factor in mall failures around here. And it wasn't competing malls, because New Orleans malls are spread pretty far apart and each mall has a niche (this is the expensive mall, this is the mall with the biggest Gap, this is the only mall with a women's business store, etc.). The answer, as with most places in New Orleans, was the neighborhood. B.P. was built at the tail end of the good days of the oil industry, which really went bust about 2-3 years after the mall was built. The housing around it was pretty mediocre-level in the first place. The mall held up for a while, but it really couldn't keep its head above water as the housing surrounding it became Section 8, HUD repos, etc. Miscreants started frequenting the mall. I don't know how much actual crime occurred there, but the perception of the area was really, really bad. Also, it's across from a really bad-reputation high school known for gang activity (real vs. perceived again), alma mater of Kordell Stewart. The Westbank is snobbishly regarded by most New Orleanians as kind of a gross place anyway, so it has to have a major draw to get Eastbankers to venture over the Mississippi River. At one time, Belle Promenade was enough of a draw. Unfortunately, this was not to last as the neighborhoods around it collapsed. Also during the 1990s, a lot of newer, truly upscale neighborhoods (for people mostly unaffected by the decline of the oil industry) were being built closer to Oakwood. These rich folks wanted a convenient place to shop and not have to cross over to the Eastbank. And Oakwood installed a branch of the Jefferson Parish Sheriff's Office, making shoppers feel safer (everyone knows Sheriff Harry Lee is very hard on criminals). The stores in Oakwood got nicer, too--so people were willing to cross the Mississippi to go to Oakwood, which was a lot closer drive for most New Orleanians than B.P. Suddenly, Oakwood's proximity to the projects was not so much of a concern for people crossing the river who a) wanted to pay less retail tax and b) maybe find a better bargain than at an Eastbank mall. Right before this all happened, Oakwood was hobbling on one leg. Today, Oakwood is booming. Belle Promenade is completely gone. The highlight of B.P. was the theater. My husband saw many a flick there. My family frequented the cinema as well. It was a really top-notch place in its day, as close to stadium seating as you were going to get in the entire city. The theater was a MAJOR draw for everyone in town. Finally, B.P. was a draw for people from the country (like my family) who wanted to do some city-level shopping but who didn't want to have to drive to a more crowded suburb or the city itself. But once the crime perceptions started up, country people didn't cotton to the atmosphere. So they stopped going to B.P., too. 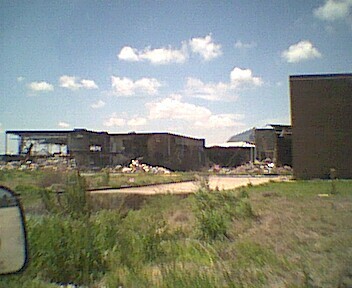 As with all other malls I've seen on this site, a Wal-Mart Supercenter was built on the property--but not in the area of the mall itself, where an enormous pile of rubble now lies (it's been there for 5 years). There's a Home Depot on campus, which was there when the mall was still present, and which has always--and to this day--done well. At one time there was talk of a Kmart Supercenter being built where the rubble is, but that was abandoned with the chain's reorganization.